Technological Unemployment: Should We Fear Innovation? Technology is constantly improving and affecting more people throughout the world, however an often misunderstood, and as a result highly debated topic is how technology, and specifically automation, negatively impact current jobs, leading to technological unemployment. Over the past decade the labor market has been undergoing low wage increases and increased automation, leading to significant and very understandable angst for those who have been disadvantaged by what many refer to as “progress”. Many media outlets cover the movement towards automation and technological unemployment as a negative form of innovation, mainly because its easier to see the downside than the upside that new technology creates. If the reverse was true innovation would be easy and everyone would be an innovator. That is why there are innovators and then there are pessimists, those who constantly critique innovation. In previous articles we have reviewed in depth that those who are most disadvantaged by low wage increases and technological unemployment as a result of innovation should focus on constantly improving themselves through education to improve their value proposition to employers in new sectors or job positions. There is a significant need for skilled labor that is able to work with new technologies, in fact, wage growth in that sector of labor has been superb, particularly in manufacturing, which may be a surprise for many to hear. Sadly, the reality of the world indicates that we need to constantly improve and learn, otherwise we succumb to the risks of the world moving away from us, and as a result demanding outdated skills less. We’ve also reviewed the impact that financialization has on labor – to put it lightly, its not pretty. In addition, youth employment has been the lowest in 20 years. What we are stating is that there are numerous dynamics at play, and that it is not correct to label the labor market in one broad stroke as either being good or bad. Automation is only one factor affecting the labor market, which we will review in depth. An example of technological change is smartphones, specifically smartphone apps. One app that displaces jobs is called Yousician, which utilizes technology to make learning an instrument fun and easy. It has features which tell you when you’re playing incorrectly. The app is easier to acquire than a teacher, since you don’t have to physically drive someplace to take music lessons. It’s also much cheaper than paying for hourly personal lessons. This advancement decreases the number of jobs available to music teachers which is what is often reported in the media. What’s often not reported is that the Yousician app itself created jobs and saved consumers money. Even though the consumer is usually highlighted in the media, the jobs market gets precedence in these stories. To give a more general example, if a firm invests in automating a factory, jobs are lost, which is clear to see because when the firm announces the layoffs, it says automation was the reason it made the decision. It’s tough to determine how much this lowered costs and how much of the costs decreases were passed on to the consumer because the company likely won’t publish that. While firms are in favor of automation, they won’t publish this information because it would hurt their ability to compete. This leads us to an interesting discussion about public policy. The government has two goals to appease the people. The government wants to make sure jobs are plentiful and that pay growth is keeping up with inflation or possibly beating it. Since the government doesn’t create jobs, the main levers it pulls are tax policy and regulatory policy. Wages and job creation are opposing forces. The faster hourly earnings grow, the less number of workers firms can afford to employ. This factor is determined by supply and demand. One of the regulations governments employ to boost wages is the minimum wage, which we have previously detailed in depth in the article titled Destroying Minimum Wage Fallacies. Any proponent of the minimum wage only looks at the worker who gets a higher wage and not the worker who is passed over because firms can’t afford to hire him. What proponents of the minimum wage also don’t understand is that firms don’t decide what to pay workers. They pay workers based on the amount of production they provide. The only way for a worker to get paid more is to have him produce more, otherwise referred to as productivity, which has been in a structural decline. We discussed in depth the technological impact on productivity in the article titled Does Technological Improvement Hurt Productivity. The increasing the minimum wage causes firms to either go out of business or employ automation to replace human labor. In NYC, the minimum wage is being risen to $15 by 2021. This is causing stress among restaurants which typically pay workers low wages. The alternative to losing money is replacing workers with robots that in the long-term are less expensive. is what Many large restaurant chains, such as McDonalds, have added digital kiosks to collect orders instead of a cashier. This trend probably would have occurred without the minimum wage increase, but it was accelerated the trend. It’s ironic that the politicians who are trying to create jobs are actually shrinking the number of jobs available. Private businesses always find a way around regulations. If they didn’t do this, they’d be bankrupt. Legislators need to have better foresight as to how businesses will react to new laws instead of enacting them without thinking of the consequences. 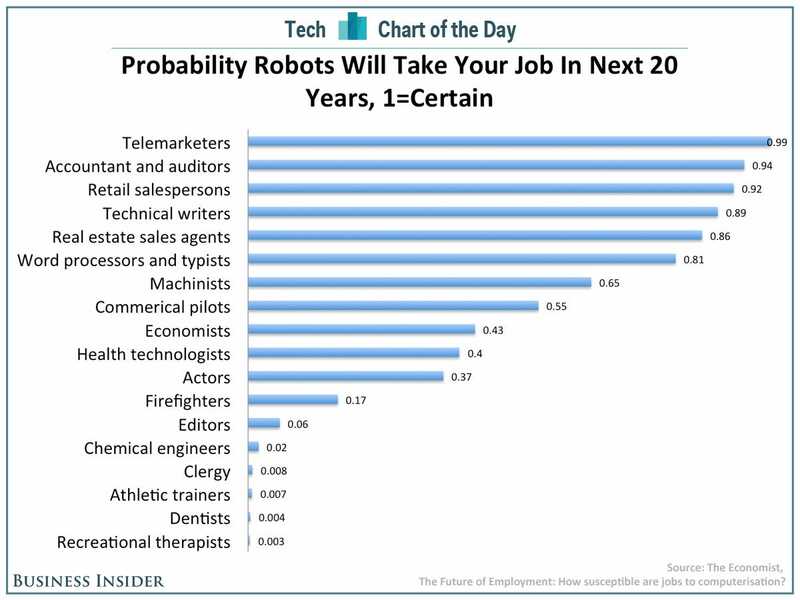 The chart below shows the jobs which are the most likely to be lost in the next 20 years due to future automation. It’s easy to get alarmed about all the jobs which are lost as a result of future automation, but many new industries will be created. As you can see in the chart, accountants are the second most likely job to be automated. Another way to look at this is that it will be cheaper to start and run a business because no accountants will be needed. Lowering the cost to run a business will allow more businesses to be created. 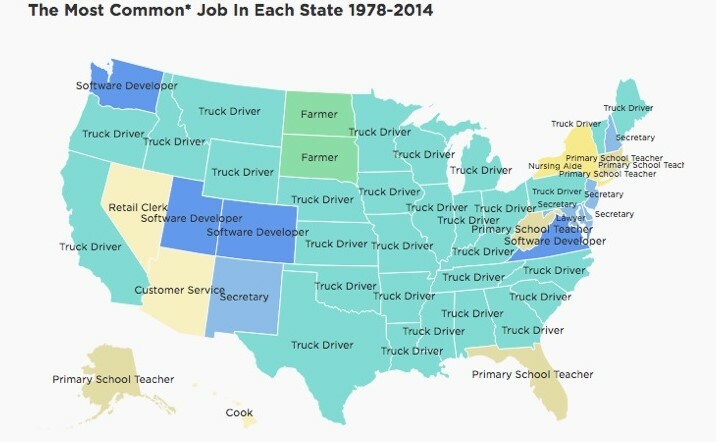 The job which employs the most workers and is about to be disrupted by automation is trucking. There are 3.5 million trucking jobs in America. Trucking is the most commonly held job in 28 states in 2014, as you can see from the image below. If this industry is disrupted, jobs will be lost. However, the only way to grow an economy which is dynamic enough to handle change is to allow the free market to work. Without a free market constantly disrupting itself, we are left with zombie companies or horse and buggy. Zombie companies are firms which rely on being propped up by the government. They provide no innovation and only exist because the government is fearful of the consequences of their failure. Proof that the economy can handle this transition is the image below. 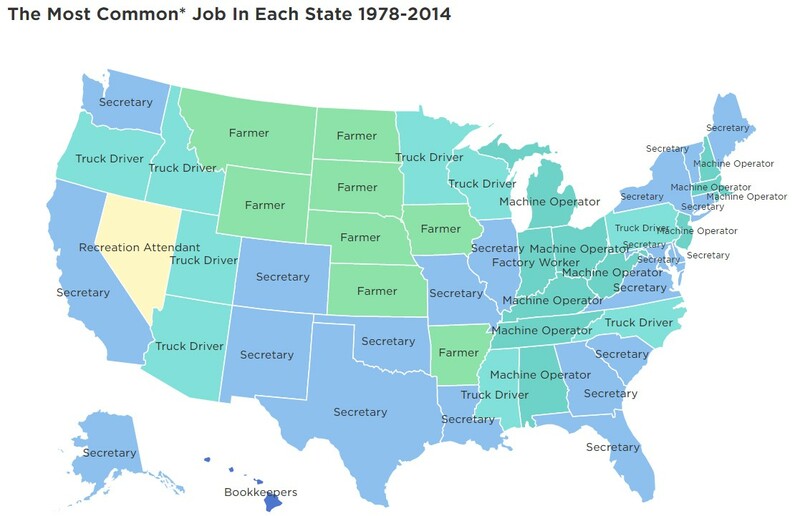 It shows the most popular jobs in 1978 in each state. Farmers and secretaries dominated the landscape then. Farming machines and personal computers eliminated some of those jobs, yet the economy kept growing and created new jobs since then. One of the latest issues the economy has had is a decline in productivity growth. It’s possible that automation will increase productivity growth, helping the economy get back to the pace it has grown at historically. Automation is not a bad thing if you look at the unseen factors. Automation lowers costs which lowers prices for consumers. The consumer then has more disposable income to use on other products and services to improve the standard of living. Most of the jobs that will be eliminated as a result of technological unemployement are low skilled ones, so the best way to avoid being hurt by this trend is to constantly improve ones skills and education. Don’t buy into the doom and gloom purported by the media about how automation will destroy the labor market. The economy will become more productive because of it. Automation is only one factor affecting the labor market, and while in the short-term the negative consequences may be more visible, in the long-term the benefits outweigh the negatives.